Fontana Regional Library now offers anyone with a library card free access to eMagazines, for reading on any mobile device or computer. This new service joins our popular eBooks and digital audiobooks selection – all available 24/7 from the library’s digital collection. 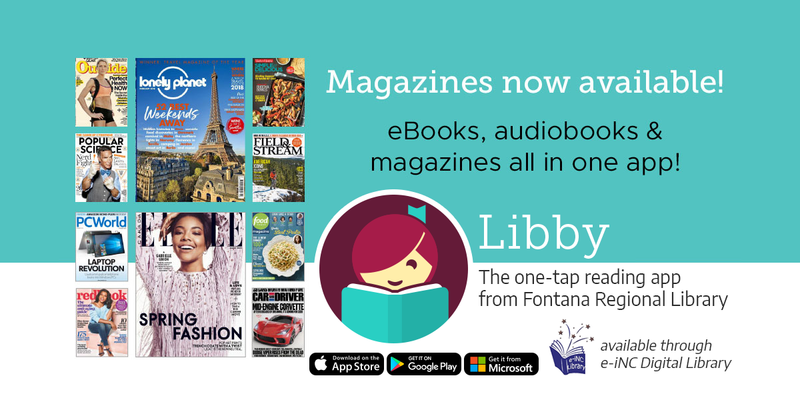 Borrowed magazines can be enjoyed immediately in your web browser or can be downloaded to the free Libby app for mobile devices. No matter how you plan to enjoy your selection, titles will automatically expire at the end of the lending period. There are no late fees! Magazines can be checked out for 2 weeks, with a limit of 6 checkouts at a time. All titles are available at any time, with no holds necessary. Magazines do NOT count toward the eBook checkout limit of 4 titles at a time. With fifty popular magazines to choose from, this new collection is guaranteed to have something for everyone. Titles include Star, Newsweek, The Atlantic, Cosmopolitan, Redbook, Food Network, TV Guide, Saveur, and many more. With each new issue, back issues remain available for checkout. This new e-iNC service, powered by OverDrive, is free with your library card. To get started enjoying digital magazines as well as eBooks and audiobooks, visit e-inc.overdrive.com or download the Libby reading app. For more information, please go to fontanalib.org/magazines or call your local library.